Home / Blog / New Year, Volunteer! I’ve worked in the charity sector nearly my entire career. This is not a smug boast, nor a plea for a salary increase, but instead my justification for writing this article. Because I work for a volunteering charity, and volunteer as a trustee for another, I often field enquiries from friends who want to donate their time – but who aren’t sure about who with or just where to start. To state the obvious, this time of year sees a lot of people’s thoughts turn to how they might improve their lives, and those of others, in the year ahead. I’m sure many people’s new year’s resolutions have included “start volunteering” or “get more involved in my community”, but sometimes it can prove hard to get those resolutions off the page and into action. My assertion that I was going to learn to drive in 2017* being a good case in point. So, in an effort to help those thinking about volunteering AND to do something about my own resolution to write more, please find below a helpful list of things to consider and do if you are wanting to donate your time in 2018. Such a simple action – but just by putting your postcode into sites like Do-it, Charity Job/Volunteer and our own Volunteering Matters, you can see a whole host of opportunities out there and close to you. Alternatively visit your local volunteer centre. So many organisations support (and give time off for) employee volunteering – but sometimes staff aren’t as aware as they could be. Ask your HR / CSR department if there’s anything already going on within your organisation, and if not, maybe ask if they’d support volunteering ahead. You could point them towards articles like this to make your case! Even if there isn’t an official employee volunteering programme at your workplace, that doesn’t prevent you from starting something. One of my best volunteering experiences was when a colleague organised with a local school for a group of us (rotating fortnightly) to go in to read with the pupils over lunchtime once a week. Not only did we get to know the local community, but we also got to know each other better in the process with the travel there and back. Who would you love to help in the new year? What local charities and organisations do you think are great? Consider approaching them direct with your skillset and asking if there’s any way you could help. Be warned – you may need to hound, not being put off if they don’t reply to the first email, and following up … loads. 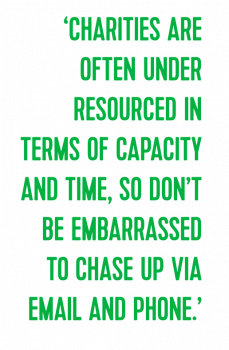 Charities are often under resourced in terms of capacity and time, so don’t be embarrassed to chase up via email and phone. What is your skillset, what package can you offer? Charities (especially smaller ones with fewer volunteers) can be a bit baffled if someone just says “Here I am and willing”. Coming to them with a menu of options of how you might help is a great idea. Especially in ways that doesn’t require too much extra work on the charity’s part. 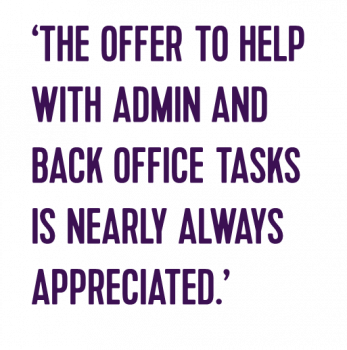 It might be considered boring by some – but the offer to help with admin and back office tasks is nearly always appreciated. 6. Would you ever become a trustee? Or a school governor? These types of volunteering roles are more time intensive but are also some of the most rewarding. I’ve found being a trustee, and latterly chair of the board, for Magic Me one of the most scary learning curves I’ve been on, but one that has benefitted me so much. I just hope Magic Me would agree! Take a look at Charity Jobs’ trustee section and Inspiring Governance for trustee and governor roles out there. On a Magic Me tip, a quick final plug for some of my favourite organisations making volunteering easy – the Ronseal titled Cocktails in Carehomes (does exactly what it says on the tin) from Magic Me, my own wonderful workplace Volunteering Matters and the brilliant and ever growing GoodGym who combine doing good with getting fit, and if they aren’t in your area, you can help them get there. This list is NOT exhaustive, and we would love to hear your suggestions and thoughts via twitter on #newyearvolunteer. We will happily revisit and update this article accordingly, as it is where I intend to point every friend who gets in touch about volunteering ahead! *It’s January 2018 and I don’t even have a provisional license yet.